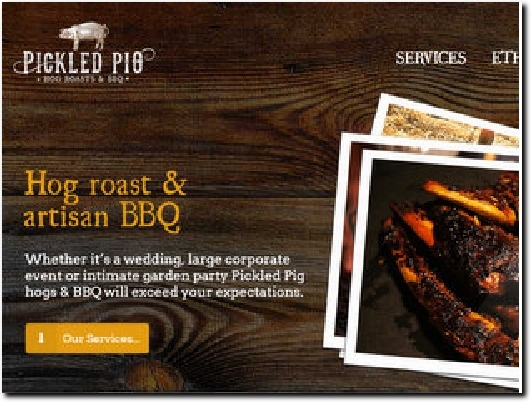 At Pickled Pig we offer a traditional hog roast and artisan BBQ concept where the emphasis is quality produce, traditional techniques and culinary expertise. With over twenty years of experience smoking, grilling and roasting meat you can trust Pickled Pig to look after your event no matter how grand. Our friendly, professional team will travel to your venue and set up when it suits you. We aim to cook, serve and clean up with a minimum of distraction to your event. We will also be delighted to liaise directly with your party planner or venue to minimise stress from event preparations. Our Gloucestershire old spot pigs have been fed and loved and this is reflected in their texture and flavour. They are produced by a local small holding farmer at world ends farm in Saltford between Bristol and bath, our pigs are fed on a diet of fresh fruit and vegetables, pig nuts and beer barley. Although great on their own with a little salt, at Pickled Pig we offer something a little different, we use brines and flavoured rubs to enhance the natural flavour. Using glass fronted rotisseries with temperature control to ensure an even roast, each Pickled Pig is slow cooked to perfection. Salted and brined whole pig, slow roasted until crisp served with Hobbs House sour dough buns, crushed Bramley apples, sage and onion stuffing, crisp salted crackling and traditional slaw. Boned, jointed and rolled pork with fennel, rosemary and garlic, spit roasted and served with ciabattini rolls, pine-nut, lemon and raisin stuffing and gremolata dressed rocket. A whole pig rubbed with creole spice, washed with dark rum, spit roasted and served with Martinique pineapple and spring onion salsa coconut bread and creole potato salad. Texan pit style BBQ whole pig rubbed with Pickled Pig magic dust, spit roasted for twelve hours served chopped with sticky sauce, cemitas rolls, Carolina slaw and pickles. Spit roasted whole lamb infused with ras el hanout, garlic and lemon. Served with fennel seed flat breads, pistachio sauce and jeweled tabbouleh. Spit roasted whole lamb, brined in rice wine vinegar, five spice, honey and ginger served shredded with hoisin sauce, cucumber, spring onion and steamed pancakes. Slow roasted whole spring lamb rubbed with garlic and rosemary. Served with crusty cob rolls, mint sauce and honey roasted vegetable salad. Strip loin of local beef crusted with maldon salt and fresh horseradish, washed with stout, cooked to your liking and served with crusted cob rolls, mustard marinated beef tomatoes and wild garlic and baby herb salad. Local fore-rib of beef studded with thyme and brushed with treacle. Cooked to your liking and served with crusty baguette, mustard mayonnaise and rocket and pickled red onion salad. Low and slow cooked collar of pork, pulled with Carolina hot and nasty sauce, baby back ribs smoked of hickory wood, sticky buffalo hot wings. served with mango Habanero salsa, home made pickle tray, apple slaw and cemitas rolls. Mexican banana leave smoked - braised beef flank, BBQ short ribs smoked with pecan wood and Asado chicken legs served with floured tortillas, Tomatillo salsa and Iron cooked cowboy beans and sour cream. Goucho ribs steaks cooked over direct heat BBQs, grilled beef ribs and spatch-cocked whole chicken with chimichurri, pan de chapaand flame roasted pepper and zucchini salad. Hand made fresh pork sausages, lime and coriander marinated yellow fin tuna steaks, fennel, chilli and lemon marinated Hallumi cheese kebabs and home made Angus beef patties. Served with Hobbs house sour dough buns and warm potato and chive salad. Butterfly Whole legs of lamb marinated in chilli, turmeric lemon and sweet paprika, maize fed chicken thighs rubbed with ras el hanoutand preserved lemons served with harrisa, minted yoghurt, chilli flat breads and tomato and aubergine salad. This is just a small fraction of the menus and ideas that our chefs produce. We are also able to make and serve a wide range of delicious starters, sharing boards, mezzes and anti-pasta as well as amazing compound salads using a wide variety of flavours from all over the world. Our specialist pastry chef can also prepare the very best quality desserts, gateaux, trifles and sharing desserts. We hope these menus and ideas are enough to get your mouth watering and your taste buds salivating. If you have ideas you don't see above, then please do not hesitate to talk to us about them. I'm sure with our expertise in all types of cuisine we can make them work and create a unique menu tailored to your exact requirements. A Bristol-based catering company with over twenty years experience, covering the south-west from Devon to Gloucestershire. The Gloucester Old Spot pigs used are reared on a smallholding between Bristol and Bath, where they are treated like pets. Lamb, beef and poultry are also available as an option. Contact leads to phone and e-mail details and an enquiry form. From the Food tab you can access Sample Menus, showing the wide range of barbecue options available.